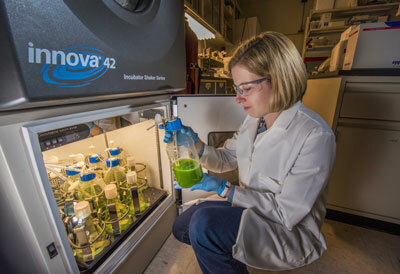 (Nanowerk News) Sandia National Laboratories Truman Fellow Anne Ruffing has engineered two strains of cyanobacteria to produce free fatty acids, a precursor to liquid fuels, but she has also found that the process cuts the bacteria’s production potential. Micro-algal fuels might be one way to reduce the nation’s dependence on foreign energy. Such fuels would be renewable since they are powered by sunlight. They also could reduce carbon dioxide emissions since they use photosynthesis, and they could create jobs in a new industry. President Barack Obama, speaking in February at the University of Miami, advocated for investments in algae fuel development, saying they could replace up to 17 percent of the oil the United States now imports for transportation. She has been studying the direct conversion of carbon dioxide into biofuels by photosynthetic organisms under a three-year Truman Fellowship that ends in January. She presented her project at a poster session in August and published her work on one strain, “Physiological Effects of Free Fatty Acid Production in Genetically Engineered Synechococcus elongatus PCC 7942”, as the cover article in the September 2012 issue of Biotechnology and Bioengineering. Truman Fellow Anne Ruffing looks at a flask of cyanobacteria with precipitated fatty acid floating on top. She has engineered two strains of cyanobacteria to produce free fatty acids, a precursor to fuels, as she studies the direct conversion of carbon dioxide into biofuels by photosynthetic organisms. She is using cyanobacteria — blue-green algae — because they are easier to genetically manipulate than eukaryotic algae, the natural “oil”-producing photosynthetic microorganisms more commonly used for algal biofuels, and because cyanobacteria can be engineered to create a variety of target fuels. Genetically engineered cyanobacteria excrete FFA and allow fuel to be collected without harvesting the cyanobacteria. This lowers the requirement for nitrogen and phosphate and reduces costs. But current yields from engineered strains are too low for large-scale production. Ruffing favors cyanobacteria because fuel from engineered cyanobacteria is excreted outside the cell, in contrast to eukaryotic algae, in which fuel production occurs inside the cell. Ruffing hopes to continue working on strain development after the fellowship ends.